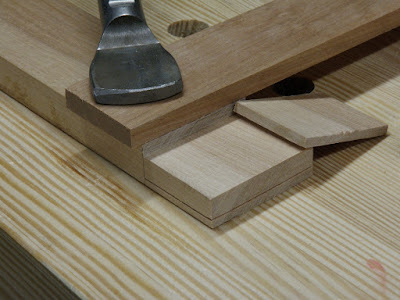 In this blog post, Chris Schwarz used a flush-cut saw and guide block to cut tenon shoulders. 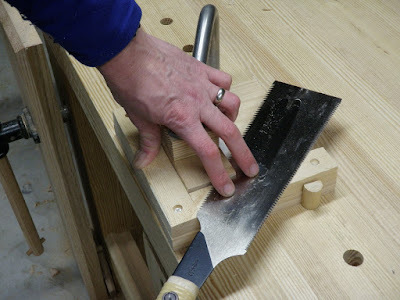 It produced excellent results, and got me to thinking about using a ryoba and guide to cut the cheeks. 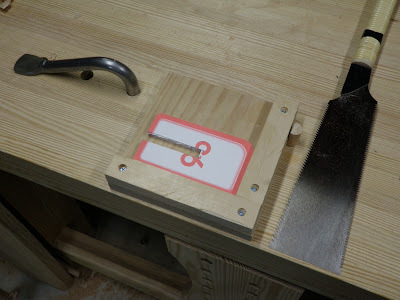 A little trial and error showed it could be done with a simple jig. 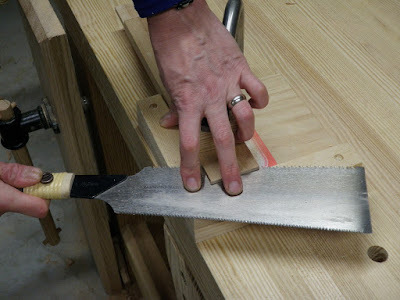 Like the flush-cut saw, the ryoba has no set to its teeth, so it won't damage the jig (not too much, those teeth are wicked) and leaves a smooth surface. The jig took all of 10 minutes to make. The only requirements are a flat base board and guide pieces of equal thickness. You can see where I let the saw flex too much and the sides of the teeth chewed on the jig. It uses my favorite all-purpose precision shims, children's flash cards. The ones here are notched to slip over the parallel guide on my leg vise. 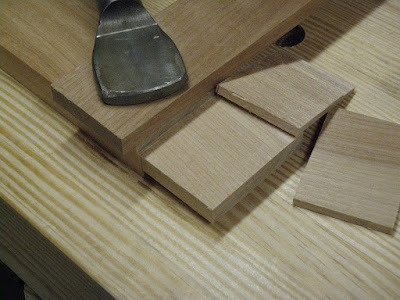 A test piece of cherry ready to cut, with enough shims to leave the desired tenon thickness. Cutting the first corner. Use the rip side of the ryoba. The next corner. The teeth of the ryoba actually work quite well against the grain like this. Taking it flat down to the mark. 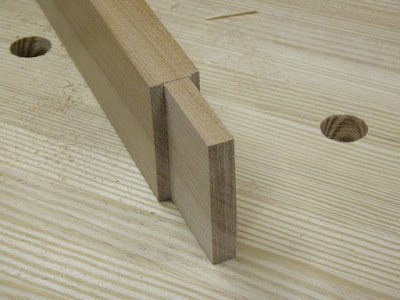 After flipping the piece over in the jig and cutting the other cheek, resulting in a perfectly centered tenon. Notice how uniform and parallel the cuts are. Setup for the flush-cut shoulder cut. The photo just doesn't capture how clean this cheek is. Notice the small reddish streak lower right on the bench: the back edge of the flush cut saw is sharp, so don't flatten your fingers against it while sawing! The other shoulder. I did a lousy marking job on this test piece, so my shoulder lines don't match on both sides. 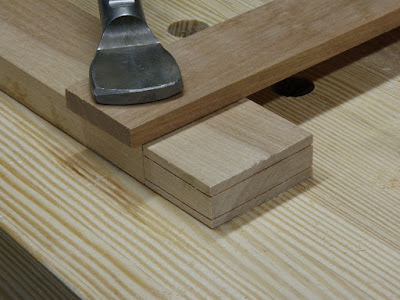 The finished tenon straight from the two saws. Provided the mortise is an accurate match, this will be a nice fit. 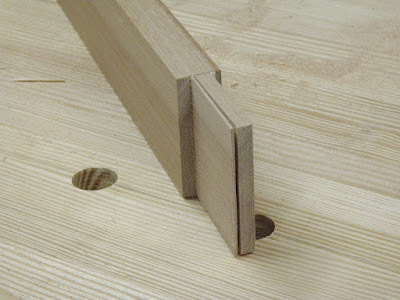 My personal goal is to develop the skill to saw tenons like this free-hand with a backsaw. I'm not there yet, so it's nice to know this technique is available. Stupid Sawyer Tricks: the precision of this cut got me to wondering just how thin a slice I could take. I added 6 flash cards to shim it up a bit higher. The slice isn't much thicker than the saw kerf. Finally Monsieur, a waffer-thin mint! Slice off small veneers of really expensive stuff like zebrawood for book-matching on a small box lid. Make matching veneers for shimming up a loose joint or dutchman patches. 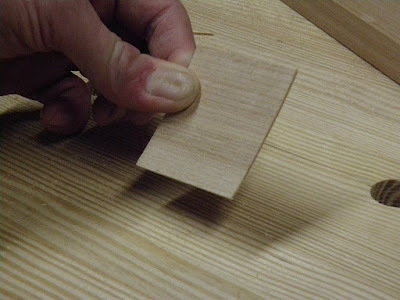 Do a series of slices for a small bent-wood lamination. Make various small craft items, like bookmarks, wooden cards, or Christmas ornaments. 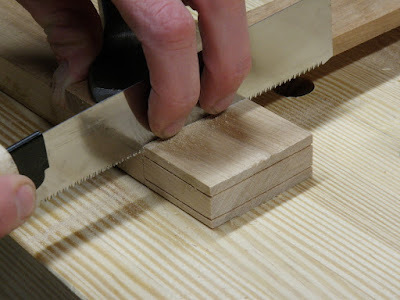 Use the jig to cut key slots in the mitered corners of a frame (make two cuts, leaving thin waste that you can clean out with an extra-thin mortise chisel), then cut contrasting key stock this way. The jig and card shims give you very precise control of the slice thickness. You could probably continue for some distance down the piece for longer slices, although at some point it would be worth putting a guide piece down the other side of the stock. Then you have your own custom micro veneer mill! Great, this is absolutly great! You should send that to a few wood working mag, it could bring you some free stuff! I realy like the idea of shims or small veneer pieces! Fabulous! THANKS for taking Schwarz's article to the next level ... and for the fine photo tutorial. My saw till is very sparsely populated, so much so that when I built my workbench, I cut tenons on the legs free hand with a 15 inch Stanley toolbox saw (western, tempered teeth). Yes, they gave "snug" a whole new meaning, but the bench hasn't fallen apart yet. I now have more tenons to cut and this technique (along with a new saw or two) shows me exactly how to get better results that are appropriate for the project. (not fine furniture yet). I second bob - thanks for taking the Schwarz article to the next level. Actually, I have sawed (or is it sawn?) my first tenons this weekend (for utility furniture), and I used a Ryoba as well, but I used it freehand. The cuts turned out quite nice, and I managed to split most of the lines. Of course, the saw wandered away from the lines on two occasions, and exactly there, where it will be visible on the finished shoe rack. I'll write a post about it in the next days. Too bad you didn't write this article two days earlier. I like my Ryoba Saw, I started using them about ten years ago as a trim carpenter and took a little good nature teasing for it. Then I started to see a few more ryoba saws on the job and someone was always using mine for fine cuts. It looks like you came up with a wonderful way to cut cheeks, my only question is why do you want to trade it for a back-saw. if it works as well as it appears I would stay with the Ryoba. Thanks for the comments, I'm glad you guys find it useful! As to why not just stick with the ryoba? That's complicated by several factors and gets into the process vs. product argument. I want to develop the skills for the traditional techniques. Mostly, for whatever reason, the English tradition calls to me (you wanted a rational reason?!?). So I've invested in those tools, and I want to make that investment pan out. But I'm also a pragmatist. I like having all the tools available in my toolbox, literally and figuratively. And it's fun trying to build things different ways. That gives me versatility for dealing with different situations. Versatility...is a great reason in and of itself. Different situations can call for different tools and different skillsets. Thanks for another great tutorial. I look forward to applying this technique. wonder if you can adapt this for resawing boards straight also? Yes, I definitely think you could. Start the resaw cut this way, then once the blade is well into the cut it should track straight on its own. You might need to give it a little twist or side pressure occasionally to help steer it. Then do the usual resawing trick of flipping the board over and coming in from both ends and all corners. The only limitation might be in how wide a board you could resaw, because the ryoba blade is relatively short. There are longer Japanese saws that might be more appropriate for wider stock. 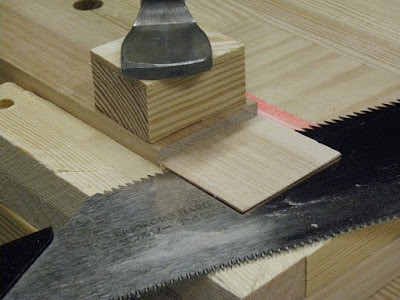 It looks like you switched saws for the cross cutting of the shoulder, is there a reason you didn't use the cross-cut side of the ryoba? Yes, that's correct, I used the flush cut saw for the crosscut due to its finer teeth (plus, that was the saw used in the original post I was following up on). 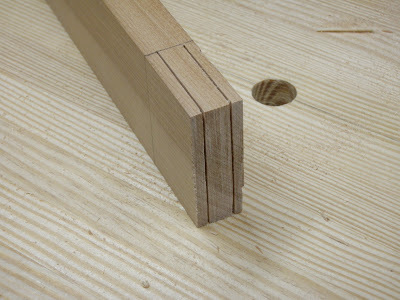 However, the ryoba crosscut side would probably do a fine job if the flush wasn't available. This is the only way I find I can make long rip cuts. 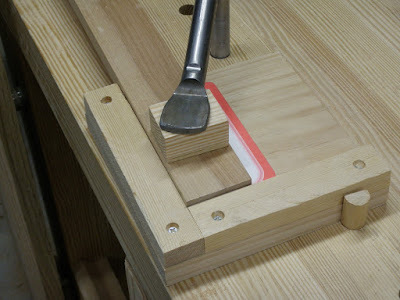 I've had to use this method a lot, though I usually just clamp a piece on each side so they stick up past the top. I sometimes have to put a little pressure on the far side of the blade to prevent wandering, and can't trust the far side to track just because the near side is true on the line. Try a bit of waxed scrap wood or a pinch of rag w/ wax. Then again, I probably screwed up the teeth at some point and others will have no problem with tracking. Wow. That is amazing trick. Thanks for sharing. 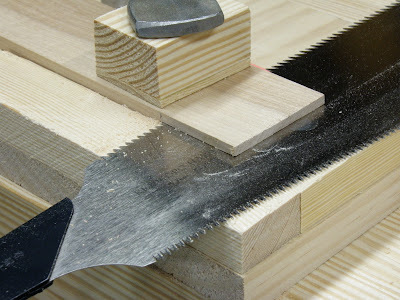 i would take your jig to a "higher" level by inserting some rare earth magnets on the fences to help "clamp" the saw blade to the sawing plane, like david barrong dovetail guide, you might need to add some low friction tape above the magnets to help with the saw gliding movement, great work! !